Caption slip reads: "Photographer: Mitchell. Date: 1952-08-02. Reporter: Petty. Assignment: SPCA opening shelter at 9330 Garfield Ave., S. Gate. 47/62: 'Pups' and Eric Adams, 9, with medal given pups for saving Eric's life. 61: TV announcer Geo. Putnam and actress Lina Romay with pup. 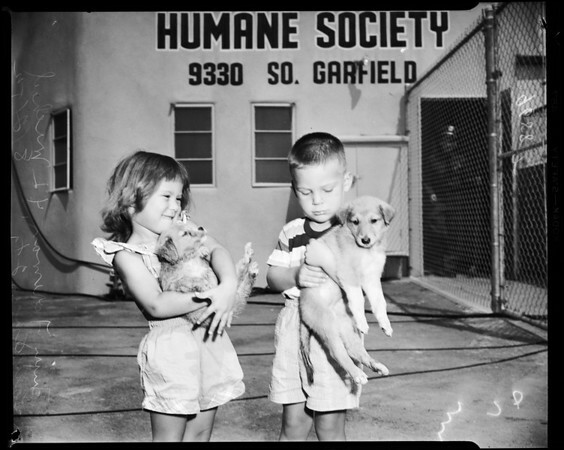 48: Terry Foreman 4, and Michael Lawrence, 2 1/2, with dogs from shelter".